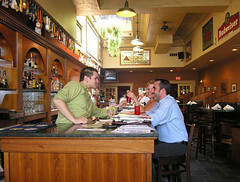 "Pearly Baker's Alehouse opened its doors in 1994 on Historic Centre Square in downtown Easton, PA. 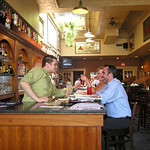 The taproom boasts a gleaming 40ft Vermont marble/mahogany bar and booths that comfort many thirsty guests. In the center of the vibrant blush and charteuse dining room, the original 1940's crystal chandelier casts a warm glow for intimate casual dining. Pearly's (as it's fondly called) was the flagship restaurant in a now bustling restaurant district, just a block from the State Theatre" (Pearly Baker's).